If you purchased a 12-inch MacBook or MacBook Pro with Retina display and have experienced issues with the anti-reflective coating wearing off or delaminating, Apple may repair the notebook free of charge. Apple will replace Retina displays on eligible models purchased as far back as June 2012 until October 16, 2017, or within three years of the original date of purchase, whichever is longer. The program was extended to provide affected customers with a longer window of time to get their notebook serviced. The program has not been publicly announced, but Apple confirmed to MacRumors that repairs continue to be handled internally through AppleCare. Apple does not plan to announce the program publicly at this time, unlike its iPhone 6s battery replacement program and over a dozen others listed on its website. We recommend affected customers schedule a Genius Bar appointment at an Apple Store or contact Apple support by phone, online chat, or email. Click on "get help" on this page, and then select Mac > Mac notebooks > Hardware Issues > Display Issue and support options should be presented to you. Apple's support website will ask for your Mac's serial number, which can be found by clicking on the Apple logo in the top-left corner of the screen and clicking on About This Mac in the dropdown menu. Affected customers can also visit an Apple Authorized Service Provider to determine if their notebook is eligible for coverage. If you have already incurred out-of-warranty costs related to this issue, you may be eligible for a refund, which can be initiated by contacting Apple support directly. MacRumors revealed the repair program's existence in October 2015 following over two years of online complaints from thousands of customers within our discussion forums, on the Apple Support Communities, and elsewhere. 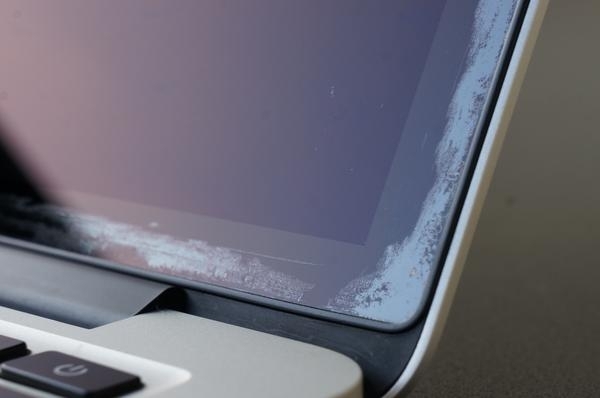 A website called Staingate contains a gallery of MacBook Pro models with seemingly damaged anti-reflective coating, revealing that the blemishes can extend across the entire screen in extreme cases. Meanwhile, a Facebook group related to the issue has nearly 9,000 members and continues to see regular activity. Go back to matte screens. Man, the glass reflection is pretty annoying. I have two ACD's on my bright room and they are gorgeous. I was working on a TB display on a bright rooms and I have to move the monitor all the time to avoid reflections. The MBP is the same. While I get the look of the glass is nicer, the matte screen is wayyyyy more functional. Apple's QA Department did a terrible job here. Even if it's a free replacement, it already caused trouble and aggravation to the enduser. What an unfortunate choice of name — Staingate. What is the source of the stain, eh laptop owners? Hmmm? Hmmm??? It's not a stain, but loss of the anti-reflective coating. Yes. How nice of them to fix a problem they created without additionally charging the customers who have been inconvenienced by it. Never had that happen, I don't buy apl anymore: correlation? Speaking of high end displays I her 5K IMac displays have severe image burn for minutes after too. Is this why they punted to LG? Not being rude, but then why do you come here? Genuinely curious. I am always fascinated when people denounce something (like a religion), and then can't seem to actually "leave" it. Or they become antagonistic. What the hell is going on with Apple these days? Reading stuff like this almost daily is depressing. I had this issue on my 2012 rMBP. While it was inconvenient, Apple replaced the whole lid. Not only that but while there, I was griping about overheating power supply where the Magsafe connects. They ended up replacing the entire logic board and power supply, for free! So new lid, new logic board and power supply > $900 repairs, all for free, on a laptop 2 years out of warranty. This would never happen with a PC manufacturer. I remember those people! I wonder where they're all at now… sure seemed like they came out of the woodwork to spit their 2¢ of wrong opinion then, I'm certain they'll do "the right thing" now and come forward and apologize and acknowledge their jackassery. Positive they will. Surely. Just got my mid-2012 Macbook Pro Retina back from Apple after the screen started degrading a couple of weeks ago. Only found out about this after Googling the problem. Called Apple customer service and they immediately said to take it in to the nearest store which was here in central London. Took it in and within a couple of minutes they knew what to do. Straight on the iPhone clicking through menu's like it was second nature. Implying to me that this was quite common. Took 4 days to come back to me and they replace the entire top half of the laptop so it effectively looks brand new. Personally think it's disgusting that they haven't informed people formally. They know who has purchased because when I called them up, they asked (without me stating) whether it was in reference to my Macbook Pro that I purchased in 2012. Such as shame that they've become so focused on profit over brand - a balance is achievable but then that's what they brought in Tim Cook to do and (to that point) he's achieved with aplomb. I'd have effused about them for months on end if they had have done. Instead I continue to question my commitment to them and weigh up whether I can switch over to Windows without too much pain.